Every once in a while, there are weddings that in thinking of how I am going to blog about it, I feel as if it is next to impossible to sum everything up in 10 images or less…this was one of those type of weddings. In getting to know Dena and Rich through email, phone calls, and a great engagement session, I knew that this was going to be an extra special wedding for me. I can say that I all my couples just rock, but, often it seems as if the ones that complete an engagement session with me become more sharing of what their day entails, more relaxed knowing that I’m going to get amazing photos for them, and it makes it easier to capture many more of the moments that are important. During the time that I’ve gotten to know Dena, in addition to her being lovely on the outside – I’ve had an opportunity to see her as a warm, caring, and giving individual. When I arrived, one of the first photos that I took of the day was one that is telling of Dena’s nature…even on the day of the wedding, when most brides are running around busily trying to get everything together for themselves (and who can blame them?) – she took the time to help her bridesmaid with putting on her makeup. 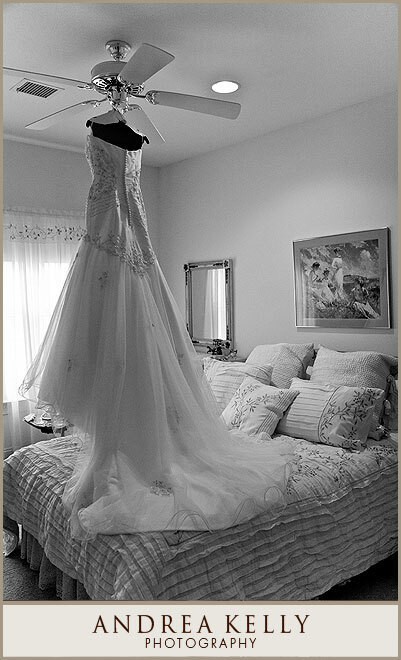 I loved the way that Dena had her dress arranged and waiting for me to photograph – the ceiling fan worked quite well! One thing that I remember when talking about Dena was her saying (and Dena, I’m sorry if I’m paraphrasing a bit), “Of course the marriage part of the wedding is the most important thing, but the photos to remember everything by are vital. It’s all about the photos!” A woman after my own heart! 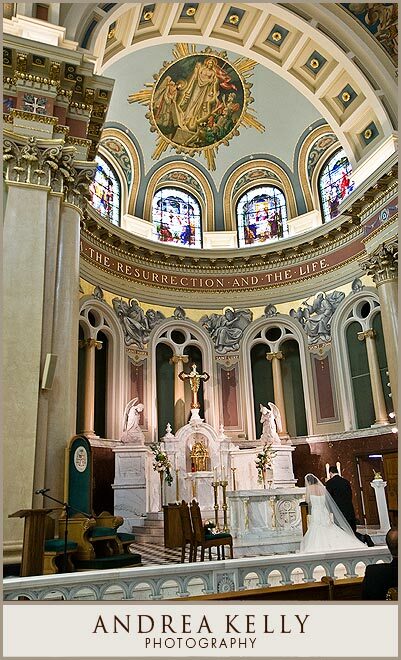 The ceremony was held at St. Patrick Cathedral in Harrisburg, PA. I just couldn’t get enough of photographing while in the church. It’s nothing short of spectacular. And the coordinator there – super sweet and helpful to me. The day was planned to allow for extra time between the ceremony and reception. While the guests were enjoying cocktail hour, I had the opportunity to get photos of the ballroom and Dena and Rich came in to enjoy the room and practice their foxtrot that they were doing for their first dance. In the lower left corner of the cake/dance photo, you’ll see a tradition that is less often seen in Pennsylvania, but I love…the Groom’s Cake…to me, any time it means more cake, this is a big plus! Rich was a very lucky man and got not just one, but two groom’s cakes and all of them were extremely yummy. I just love the closeness that you feel between the two of them here. So, seriously, how CUTE is this baby? If I wasn’t photographing a wedding, I would have taken pictures of him all day long! After we said our goodbyes and as I was getting ready to leave, Dena and Rich came up to the dance floor to dance with each other again…it’s very likely that they didn’t even know that I was still photographing…one of the last photos of the evening – they look as if there is no one else in the world, yet others were dancing all around them. Oh, I LOVE her cake!! I love it when they add a little color!! Great images, Andrea! Congratulations to Kristina and Rich! They are the proud parents of Miss L. who arrived at 11:47pm on June 25…13 minutes prior to her due date (how’s that for punctual?). Miss L. was 6 days old when these photos were taken – which is about the perfect time to take photos of newborns. I love photographing hands because they show the connection people have with each other. With Kristina and Rich, we began the tradition of photographing their hands on their wedding day, another during the maternity session, and of course, this one with Miss L’s tiny hands. While Kristina and Miss L. were taking a little break to eat, I took several photos of the nursery. Thought that these little pillows and hats were adorable. The dress that Miss L. is wearing in this photo was Kristina’s when she was a baby. Miss L. was born to be in pictures! Once again Ms. Kelly has done a phenomenal job capturing the joy and love Rich and Kris share for their beautiful baby girl. Miss L. is already so photogenic, that picture of her napping on the lamb is priceless!! Congratulations, you guys! I had the pleasure of going to school with Kris, being in her wedding, and now watching (through the phone) her be a mom to this GORGEOUS little girl!! Congratulations Kris and Rich, she truly is perfect. And…these pictures are so awesome!! I see why you stick with the same photographer—SHE IS GREAT! Jade and Brian are my second couple this year who are living in Texas but came back to Pennsylvania to get married. Their ceremony took place at St. Benedict’s Church in Carrolltown and their reception was held at one of Jade’s family member’s farm in Loretto. While several of my brides have carried rosary beads on their wedding day, this was the first time that I’ve seen it as a rosary bracelet. Isn’t this beautiful how the candlelight is illuminating their hands? I was at the opposite side of the dance floor when spying the flower girls watching intently while the newlyweds shared their first dance; I moved behind the two girls to capture this photo with them looking on. I love this detail photo that was taken while the best man was making his toast. It sprinkled off and on throughout the day, but it always seemed to stop at the points when it would have been inconvenient for Jade and Brian to do all that they wanted…of course, one of the pluses that sometimes occur as a result of rain happened as I was driving back to Pittsburgh that evening – we were getting a beautiful and colorful sunset and I spotted a rainbow, so I pulled off to the side of the road to take a photo or two. Wow!! You are truly an artist!! We love how you captured Jade and Brian’s special day. Of course, our favorite picture is the one of our two littlest girls watching intently as Brian and Jade share their first dance! We cannot wait to see the rest!! Andrea, The pictures are absolutely stunning! You are such a creative artist. Jade and Brain should be models. We can’t wait to see the rest of the photos. Andrea, we just LOVE the photos. It was such a pleasure working with you. I am so glad you were able to catch all of the details as well. My aunt Julie gave me that bracelet the day before the wedding, and it just worked perfectly. My aunt Peggy had bought us our unity candle, so it’s nice having a good photo of that too. Thank you for everything. We can’t wait to see the rest! Even though we never met face to face prior to the wedding day, from my conversations with Brooke on the phone, I knew that I was going to love photographing this wedding. So, I have shoe envy…Brooke and I talked about it and the fact that she would get to wear her georgeous Stewart Wietzman shoes and while I’m stuck in my “serviceable” Danskos; I’m sure it comes as no surprise to her that the shoes are making the blog! Love when I’m able to get a nice “portrait” style image when it’s unexpected – this was taken while Brooke was getting her veil placed on prior to heading to the ceremony. Beautiful. The next two photos are a study in contrasts…the champagne for in Brooke’s room with the Budweiser in Brad’s room. This image was captured while Brooke was waiting in the church library for the ceremony to begin and has a small story that I’m sure will come back to Brooke any time she looks at this photo. Brad’s mom (Dee) was the soloist and this is when Brooke first heard her singing. I remember looking over at Brooke and just saying, “Wow!” Dee’s voice was so beautiful, both of us were almost in tears. Thanks to my assistant who was holding a portable light, I got this dramatic lighting while they cut their cake. These photos capture the essence of who Brooke and Brad are…fun and playful – the kind of people you want to be friends with. Dana and Bill got together with me on a day when we were dealing with a week of one of the most hot and humid weather I’ve remembered in Pennsylvania in a LONG time. And they were such good sports about cuddling up with each other…or perhaps it was just that they were stuck to each other because of the humidity. Top it off with battling the mosquitos – I can guarantee that it was probably one of the most romantic dates they’ve had in their 10+ years of dating one another! Well, maybe not. To anyone who may have been watching from the outside, I’m sure that our swatting provided a lot of entertainment anyway. Note to self: next time shooting at that location in the summer after a lot of rain, remember to bring repellant. One of the things that I love about engagement sessions is the opportunity to for my couples and I to really get to know one another and create gorgeous photos that are usually taken at the best time of day – we had some fantastic lighting. You’ll see Dana and Bill again toward the end of September for their wedding taking place at the beautiful Hotel Hershey. Andrea — the pictures are AMAZING! They are above and beyond what we expected and everything we hoped for. Thank you so much. It makes us so excited for our wedding day. Can’t wait to see them all and what our guest book looks like! Those of you who follow my work, may remember seeing Kristina and Rich about a year ago – they had a gorgeous wedding on May 5, 2007 at Turf Valley Resort in Ellicott City, MD. Recently, Kristina contacted me to let me know that they are expecting a little girl and asked me to be their photographer again for a maternity and newborn photo session. There’s nothing better than documenting new milestones in my couple’s lives. Kristina and Rich – it was fantastic catching up with the two (almost three!) of you and I’m looking forward to seeing you again in a few weeks! These little bunny booties made me laugh – so cute. Hi Andrea. Thank you for dropping by and commenting on my blog. I think we met in Vegas a few years ago. I hope you are doing well! Beautiful Maternity images.. I love shooting Maternity/newborn too. Life is good. andrea, these are gorgeous! i love the mood of #3, beautiful detail. they were lucky to have you!